Try Before You Buy with a FREE DOWNLOAD! Free Trial Version provides all the features of Vivid-Pix RESTORE Picture-Fix and 10 Free Fixes. Applying patented image science, RESTORE provides 1-click improvement to scanned prints, slides, documents, and digital camera images. Fine-tune with easy-to-use sliders. 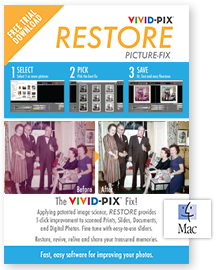 Restore, relive, and share your cherished memories.